I was asked to provide a Christmas image for the Facebook and Twitter feed of the Centre for Advanced Welsh and Celtic Studies this week, and although I had one or two other things in mind, stumbled across a pair of panels in the Church of St Twrog, Maentwrog, in north Wales. These attractive scenes in the north and south walls of the sanctuary are set with square silver stained quarries above and below and have a nice charm about them. When I came across the windows, which were probably listed on the Stained Glass in Wales catalogue six or seven years ago, I was unable to precisely date or attribute them, and looking at these windows again, inevitably the questions arose of when was the window made and by whom? None of the obvious studios came to mind as probable makers, but following comparison with the poses, painterly style and lettering of windows by Edward Frampton at Hawarden, I decided that both of the windows could fairly safely be attributed to this artist’s studio. 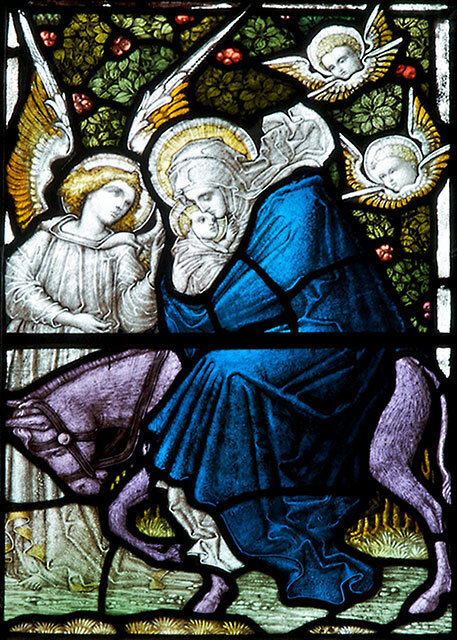 Further evidence comes from the fact that a window of Christ the Good Shepherd in the church was signed by Edward Frampton. This window shares a very similar style of lettering, the same floreate background, and also confirms that the artist had contacts at the church. The Good Shepherd window is dated 1896, the same year in which the architects Douglas & Fordham restored the church and added the chancel. This would therefore be the earliest and perhaps most likely date of the north and south sanctuary windows, although they could have been added later. What is striking about this little discovery is how unlike the Good Shepherd window these panels in the sanctuary appear to be at first glance, and they are perhaps even more removed from the windows at Hawarden that I looked at first (which didn’t help my attribution). At Hawarden the five two-light windows, made between 1886 and about 1904, all have Gothic architectural tops and bottoms, which lends them a late-Victorian appearance. In contrast, the light and space afforded the scenes in the sanctuary at Maentwrog, enhances their delicacy, rendering them visually more redolent of the Arts & Crafts Movement. Another set of windows at the Church of St Ethelwold, Shotton, make even more of a contrast, as the east and west windows all have quite dark scenes, and the large Gothic canopies in the big windows of the sanctuary apse characterise them very much as late nineteenth- or early twentieth-century Gothic Revival works. All three of these churches (Maentwrog, Hawarden and Shotton) had work done on them (or were originally built, in the case of St Ethelwold’s) by the Chester architect John Douglas, in partnership with D.P. Fordham or C.H. Minshull, and, while thinking about some other churches by these partnerships that I have visited, I was able to attribute the big east and west windows of the Church of Bryn-y-Maen, near Colwyn Bay to Edward Frampton. None of the windows in this church are even mentioned in Edward Hubbard’s Buildings of Wales: Clwyd (1986). A further look around the windows at Maentwrog brings us to the west window, in which three rather stiff figures stand within elaborate Gothic framing, and here again, on close inspection, the lettering, canopies and some of the faces recall Edward Frampton’s work at Hawarden. 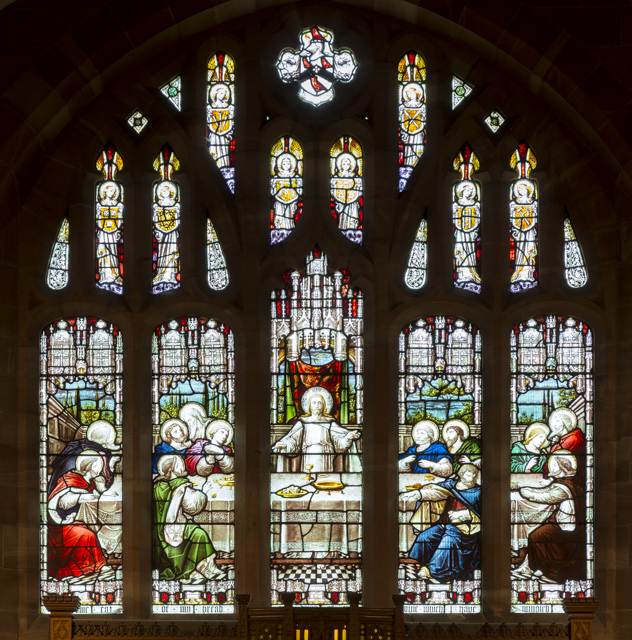 Nonetheless, they seem far removed from the panels in the sanctuary, and the comparison of these windows by Frampton is suggestive of how much the borders around windows can condition our perception of style.